definitely not where I had told myself I would finish. 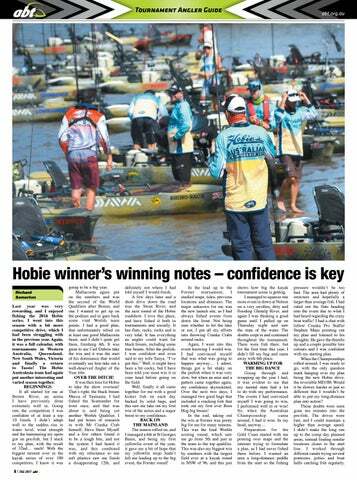 A few days later and a short drive down the road was the Swan River, and the next round of the Hobie roadshow. I love this place, and have fished it both in tournaments and socially. It has flats, racks, rocks and is very tidal. It has everything an angler could want for black bream, including some true beasts. After the prefish, I was confident and even said to my wife Tanya, “I’ve got this.” Well, it might have been a bit cocky, but I have been told you must win it in your head before going on the field. Well, finally it all came together for me with a good kicker fish on each day backed by solid bags, and this saw me take out my first win of the series and a major boost to my confidence. 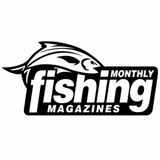 BACK ON THE MAINLAND The season rolled on, and I managed a 6th at St Georges Basin, and being my first yellowfin event of the year, it gave me a bit of hope that my yellowfin mojo hadn’t left me leading up to the big event, the Forster round! pressure wouldn’t be too bad. The area had plenty of structure and hopefully a larger than average fish. I had ruled out the flats heading into the event due to what I had heard regarding the crazy boat traffic! I had a chat with fellow Cranka Pro Staffer Stephen Maas pointing out my plan and listened to his thoughts. He gave the thumbs up and a couple possible lure colours and I was confident with my starting plan. When the Championships rolled around, I was ready to go, with the only question mark hanging over my plan being the new Hobie drive, the reversible MD180. Would it be slower, harder or just so different that I wouldn’t be able to put my long-distance plan into action? Those doubts were soon gone ten minutes into the pre-fish. The drives were fast, and I could maintain a higher than average speed. I didn’t make the long run up to the comp day planned areas, instead finding similar locations closer to the start line. I worked through different canals trying several pontoons, jetties and boat hulls catching fish regularly.